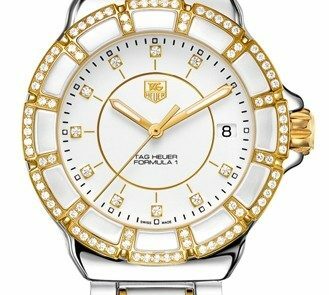 The Tag Heuer Formula 1 WAH1221.BB0865 women’s watch is nothing less than stunning and ultra-feminine. 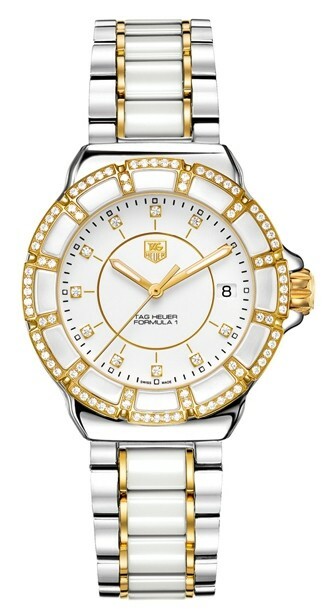 Although many men favor the Tag Heuer line of luxury timepieces for their collection of high-end sports watches as well as classic luxury timepieces; the Formula 1 line focuses on the timeless features of a Tag Heuer watch enhanced with features such as gold and diamonds that make it irresistible to women. Tag Heuer has mastered the art of creating watches with clean lines and minimalist luxury. The majority of their timepieces do not come in bright colors or superfluous extras that would overshadow the refined look of their pieces. Tag Heuer has recognized that keeping the appearance of their watch luxurious yet understated makes it stand out all the more. The Tag Heuer Formula 1 WAH1221.BB0865 will never overshadow a lady or her ensemble; the watch only augments the natural beauty and elegance of the owner. This luxury women’s watch features a gorgeous stainless steel case, ceramic and gold case and bracelet and a ceramic, gold and diamond bezel. The round case is 36 millimeters in diameter with a beautiful white dial to accent the diamonds and gold featured on the watch, sapphire, scratch-resistant crystal and date calendar. The bracelet of this timepiece has a magnificent high polish that is 8.5 inches, sizeable and has a fold-over clasp with a flip-lock and push button. The Tag Heuer Formula 1 WAH1221.BB0865 would be the perfect addition to wear to a business meeting, brunch, a weekend trip, or a night out on the town with your special someone. This luxury timepiece would be an ideal accessory for the lady who likes to add a dose of luxury to her business suit or ready-to-wear apparel. The features of this watch make it easy to transition from a day to a night look without having to worry about changing your watch. Tag Heuer has many celebrity fans and influential personalities who are ambassadors of their luxury watches. You readily see many Hollywood actors and sports figures gracing their innovative advertisements for timepieces. Russian tennis star Maria Sharpova is one of the many ambassadors for Tag Heuer and can be seen wearing her Tag Heuer Formula 1 watch. Although Tag Heuer has their share of celebrity followers, it is not reserved for celebrities and socialites. Add this gorgeous timepiece to your collection of accessories and watches and see how it can add a touch of glamour and allure to your everyday look.